Whether you're looking to have a peek at what your children are doing online or whether your own spouse is acting suspiciously on your own home computer, Lightlogger Keylogger might be the keystroke recording solution you're looking for. 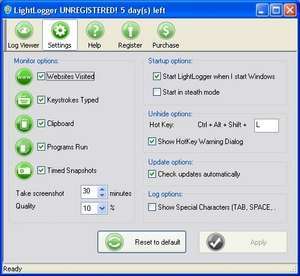 While not a freeware program like some of the other software downloads we feature in this category, Lightlogger is a pretty simple keylogging application. Though if your child is computer-saavy, this program is definitely not one that can be considered as a stealth keylogger. Lightlogger is definitely not one of the strongest applications for keylogging that you'll come across. LightLogger 6.11.8.10 is a shareware program and can be used as a demo to try the software until the free trial period has ended. A full version of the program is available after the trial period ends. For security reasons, you should also check out the LightLogger download at LO4D.com which includes virus and malware tests. Additional screenshots of this application download may be available, too. 2.41 out of 5 based on 13 ratings.